By adding remote monitoring to your fire or security systems, your premises will be protected by 24×7 monitoring to ensure that they are safe and secure. Should you premises be empty, you can rest assured that in the event of a forced entry or fire, the authorities will be alerted, giving you every chance of not suffering the consequences or severe fire damage or significant theft. 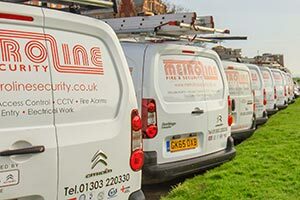 Metroline Security offer monitoring services from BT Redcare, Redcare GSM, and DualCom. In addition to increasing security, monitoring will also reduce your insurance premiums. DualCom GPRS is an intruder or fire alarm signalling device that uses both the Vodafone network and your telephone and/or IP path to transmit intruder, fire and personal attack signals at high speed. CSL DualCom have pioneered a single hardware platform which fits every grade of security risk, right the way from Grade 2, 3 and 4 Security installations to the highest specification of Fire signalling grades. The price of the product has been matched to the grade so that if you are installing for a Grade 2 specification you are not paying Grade 4 prices. That, together with the fact that there is no need for a telephone line, makes DualCom a more cost-effective alternative to Redcare GSM for your monitoring requirements. BT Redcare provides a monitoring network which monitors your alarm over a secure network and guarantees that any activation signals are received by the alarm monitoring centre. As the police and fire brigade do not have the necessary resources to respond to ringing alarm bells (and need evidence of an actual intrusion), the alarm receiving centres will receive the signal via the secure BT Redcare network, alert the police or fire brigade and ensure the most rapid response. With Redcare GSM, your alarm is monitored over a BT phone line with a GSM backup – reporting any alarm activations (including the phone line being cut to the alarm receiving centre). The secondary GSM line means that alarm activations can continue to get through to alarm receiving centre even if the phone line has been cut. If you are interested in finding out more about our remote monitoring services, contact us today to arrange for an informal discussion.